This is an interesting recipe for me to revisit, as it has evolved from my very first curry experimentation. I met a Japanese girl with Indian parents, and she set me on the curry path with a very basic starting point. I feel like I’ve come a long way since then, and it’s only right that this be the first curry recipe that I write up. I still like to try out changes every time I cook it, I encourage the same for you. 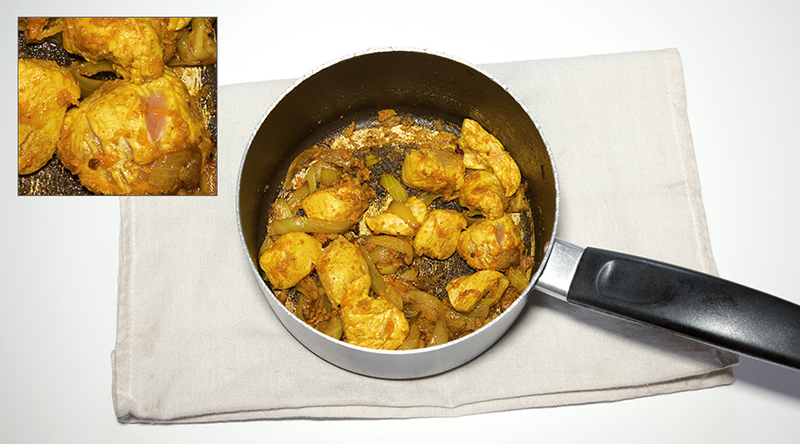 Use a pot with a thicker base because this will provide even heating across the surface when you come to simmer the curry. Onion, when chopped finely enough and cooked properly, is a good way of creating that sauce like consistency associated with curries. First heat a pan or pot with oil, and add finely sliced onion. Don’t cook the onion too fast, you want it to become soft and darkened / semi-transparent, rather than burnt and dry. 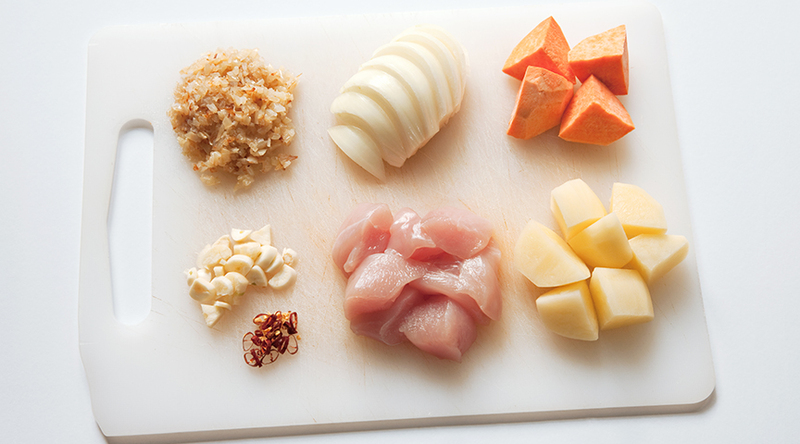 Prepare another part of the meal while you’re waiting for it to cook, or do this earlier in the day. Sometimes I prepare a load of this pre-cooked onion and freeze it in portions for future meals. If you don’t have a blender (as I no longer have…), just move the cooked onion to a plate to cool for a bit, before either grinding it to a paste or returning it to the chopping board to cut more finely before it goes back in the pot. If you don’t use a whole onion, you can wrap the exposed side in foil and store it in the fridge. Potato too has a thickening effect as it breaks down when cooked, and different potatoes work differently which is something I am currently experimenting with. 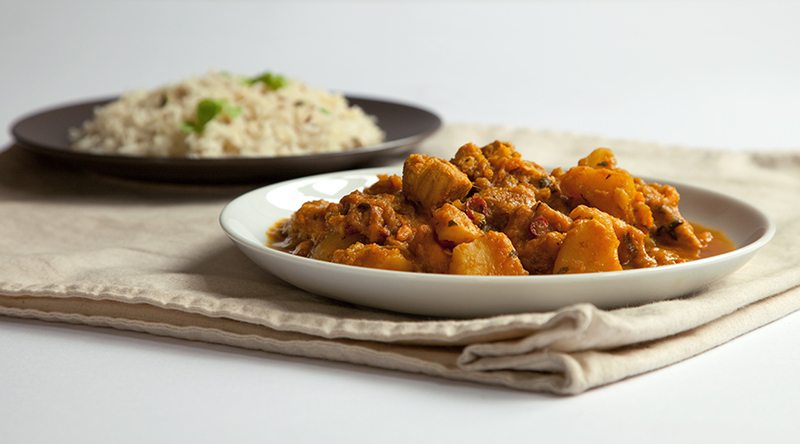 Never put too much water in the curry in one go because you may end up reaching a point where the potatoes are nicely cooked, but you have far too much liquid and therefore a diluted flavour and thin curry. The best method is to keep checking the pot every few minutes, and adding a little water to compensate for what has evaporated. If you have the time, cooking the curry more slowly is favourable. Sweet potato cooks a bit faster, so put in the pieces after the potato has been boiling for a few minutes. I tend to boil on a medium heat for 5 minutes or so with the lid on, then lower the heat and tilt the lid to allow the liquid to begin evaporating. When you notice the potato is nearly cooked, add no more water unless you want a thin sauce… Who wants a thin sauce? To prepare garlic, using a good sized knife cut off the dry stub that connects the clove to the bulb. Then turn the blade on its side and with your hand press the blade down on the bulb, this will crack the tough skin and make it quick and easy to remove. Then you can chop. Turmeric has an intense yellow colour and has a distinctive smell. It’s a relative of ginger and of the Thai ingredient galangal, and is available in root form just as they are. As you would with ginger, slice off and discard the skin, then grate in to a pulp. Sealing meat before fluid is added to a pot stops the meat becoming too dry inside, and helps it to hold together in one piece. Keep turning the chicken while frying, until the surfaces of the pieces have nearly cooked. Add your potato pieces and give them a quick fry until the meat has sealed, then add your water. Boil some water beforehand, and include enough for rice (and enough for tea if you want some tea, which I do). Normally I would start the rice at the beginning of a curry, but this meal takes a while to cook once the water’s added, so once it’s simmering, you can turn your attention to the rice. Did I mention the rice? – Fry for a few minutes, medium heat. 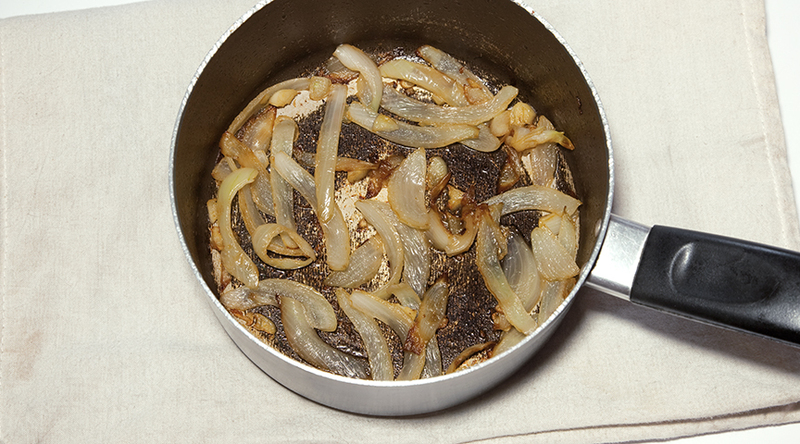 – Fry until onion and garlic begin to brown. – Fry until the meat is nearly sealed. – Fry until the meat is sealed or the pan has become dry. – Bring to the boil, then simmer for 5 minutes. – Simmer and check every few minutes until the potato is cooked. The methi (fenugreek) leaves tend to dominate the flavour (particularly the dried leaves which I prefer to use), so omitting these will give a very different taste and aroma to the curry. Omit the tomato puree for a different flavour and colour. 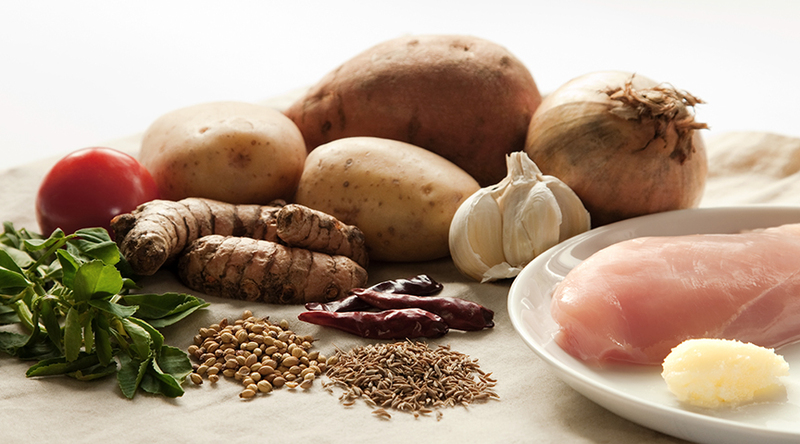 Try sometimes with just potato, and sometimes exchanging some of the potato with Sweet potato. Add fresh tomato pieces right near the end of cooking. Chopped spinach, spare cream and ground cardamom seeds instead of methi, tomato and sweet potato, create a very different curry. This entry was tagged Chicken, Chilli, Coriander, Cumin, Curry, Fenugreek, Garlic, Ghee, Indian, Jeera, Methi, Onion, Potato, Sweet potato, Tomato, Turmeric. Bookmark the permalink.